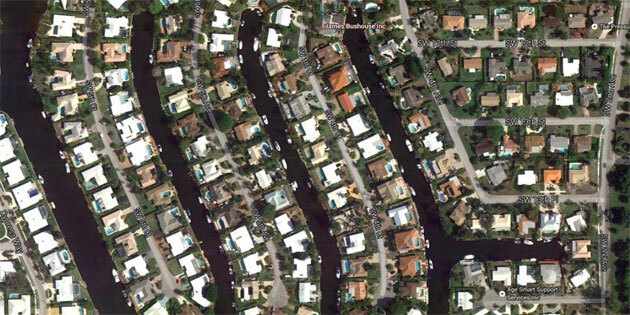 Boca Islands is a gorgeous, waterfront community located in East Boca Raton, FL. This intimate community is comprised of a blend of impressive Mediterranean-style homes and charming "Old Florida-style" residences, offering some of the most affordable waterfront real estate in Boca Raton. Homes in Boca Islands are situated along the deepwater canals of the Intracoastal Waterway, providing exquisite views of the sparkling waters and passing boats. Boca Islands offers a variety of homes for sale ranging in both size and architectural style. From single-story homes constructed in the 1960's to larger two-story homes built in the early 2000's, Boca Islands offers a wide selection of waterfront residences. Homes for sale in Boca Islands have three- to five-bedroom floor plans, ranging in size from 1,500 to over 2,500 square feet of living space. Many of the homes in Boca Islands have been remodeled and updated with modern features which include high-end tile and wood flooring, modern kitchens with stainless steel appliances and granite countertops, spacious bedrooms, and large, open living spaces perfect for entertaining. Homes in Boca Islands also offer oversized backyards and private swimming pools with breathtaking views of the tropical landscaping and waterway. Boca Islands is located just south of Palmetto Park Road off of Federal Highway, within very close proximity to downtown Boca Raton and some of the area's most beautiful parks including Sugar Sand Park, Pine Breeze Park, and South Inlet Park. Boca Islands is also just a short drive from I-95 and other major highways, making it simple for residents to make their daily commute to work or a quick trip to one of the nearby South Florida cities like Ft. Lauderdale and West Palm Beach. The Boca Islands neighborhood public schools include Boca Raton Elementary School, Boca Raton Community Middle School, and Boca Raton Community High School. In addition to these top-rated public schools, there are several notable private schools in and around the Boca Raton area. If Boca Islands sounds like a waterfront community that would fit your needs and desired lifestyle, you may also want to visit similar waterfront communities in Boca Raton such as Boca Harbour and Boca Bay Colony which also provide affordable waterfront homes in a great East Boca location. Do you want more information about any of the homes in Boca Islands? Just click the "Request More Info" or "Schedule a Showing" button when viewing the details of that listing. Also, please consider registering for a free account which will enable you to receive automatic email notifications when new homes in Boca Islands come on the market in Boca Raton, FL. If you are interested in learning more about Boca Islands or any of the developments in Boca Raton, please feel free to call us directly at 561-998-9015. You may also reach us by completing the simple online contact form provided below and one of our expert agents will reach out to assist you. We at Champagne & Parisi Real Estate look forward to assisting you in finding your next waterfront dream home in always sunny Boca Raton! Click here to see all available developments in Boca Raton, FL.